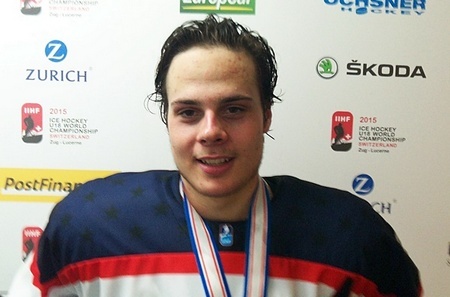 Get used to hearing the name Auston Matthews. The 18-year-old centre from Scottsdale, Arizona, just topped the prospect lists of 10 out of 10 scouts surveyed by TSN. He’s garnering an awful lot of chatter for the 2016 NHL Entry Draft and has already earned high praise from some of the greats in American hockey. Right now, Matthews is playing for the ZSC Lions in Swiss National League A. His coach is one Marc Crawford, who’s certainly excited to have a chance to develop the top pick. Matthews was just shy of the 2015 NHL Entry Draft, what with his birthday just two days off the cut-off date. He would have been right up there with Connor McDavid and Jack Eichel in terms of buzz and likely would’ve been drafted third overall. Matthews honed his skills with the United States National Development Program in Michigan before making the interesting decision to head to Zurich. In the 2014-2015 season, he managed 116 points in 60 games, including 55 goals. He was also named the Most Valuable Player at the World U18 Championships in 2015, where he led the tournament in scoring. If Matthews does indeed go in the top spot next year, he’ll be just the seventh player from the United States to do so and the first since Erik Johnson and Patrick Kane went back-to-back in 2006 and 2007. Matthews will be part of an elite group that includes the aforementioned Modano, Brian Lawton, Bryan Berard, and Rick DiPietro. Matthews would also become one of the first players from Arizona to make the grade, but some see him as the start of something special coming out of the southwestern United States. If there’s another story to be found in the 2016 NHL Entry Draft, it’s the relative dearth of Canadians in the upper echelon. Finnish winger Jesse Puljujarvi‎ is projected at number two right now, while Jakob Chychrun almost counts as a dual Canadian-American citizen. Matthew Tkachuk was, like Matthews, born in Scottsdale. And Finnish winger Patrik Laine is also receiving consideration. Mike McLeod of the Mississauga Steelhead is the highest-ranked Canadian-born player in draft talks right now, for what it’s worth. But all the talk will be about Matthews for most of the year to come and that’s not a bad thing. He’s an exciting and dynamic player and should put the spotlight on what’s going on in Arizona. Now if he can land with his favoured Coyotes, that would really be something.